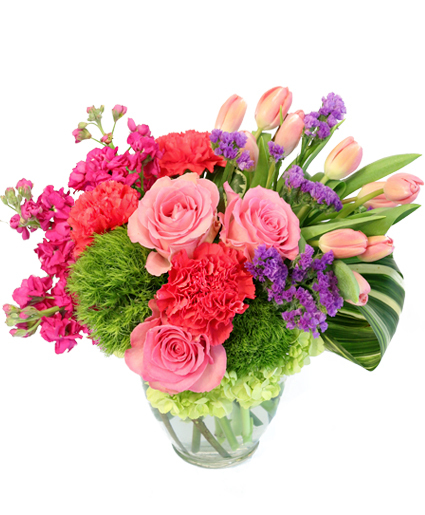 Blossoming Medley Floral Design in Warrington, PA - ANGEL ROSE FLORIST INC. 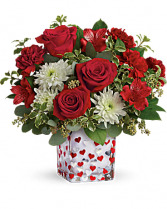 This Harmonious Bouquet Features Red Roses, Red Alstroemeria, Red Carnations, White Cushion Spray Chrysanthemums, Pitta Negra, Seeded Eucalyptus And Lemon Leaf, Delivered In The Happy Harmony Cube, Orientation: Allaround. 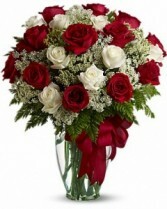 Roses and romance - a match made in heaven. 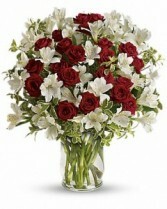 Our endlessly elegant bouquet combines passionate red roses with heavenly white blossoms in a stylish glass vase. What a classic way to say you care!